All-cellulose composites were prepared by dispersing short softwood kraft fibers in dissolving pulp-8 wt% NaOH–water. The degree of polymerization of the dissolving pulp used for the matrix and the concentration of reinforcing fibers were varied. Morphology, density, crystallinity, cellulose I content and mechanical properties of the composites were investigated. 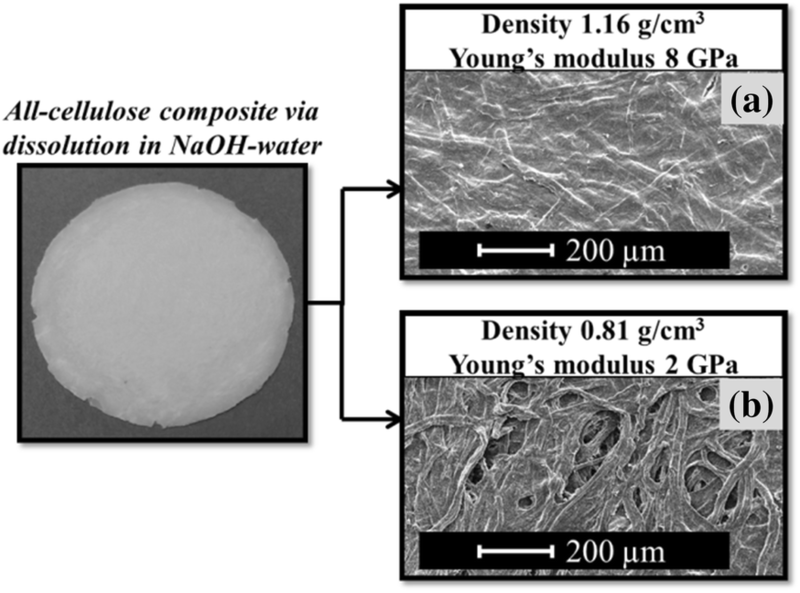 A special attention was paid on the presence of non-dissolved fibers originating from incomplete dissolution of pulp in 8 wt% NaOH–water thus decreasing the actual concentration of dissolved cellulose in matrix solution. This “lack of matter” induced the formation of pores, which strongly influenced the morphology of composites. 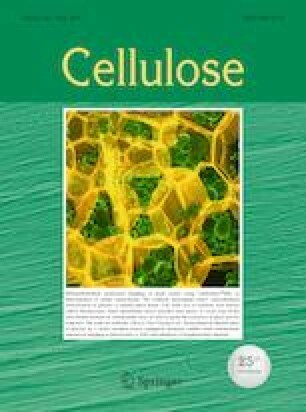 Density was shown to be the main parameter contributing to the mechanical properties of the prepared all-cellulose composites. The results demonstrate the complexity of the system and the need in taking into account the dissolution power of the solvent. Morphology of all-cellulose composites: matrix is from low-DP dissolving pulp (a) and from high-DP pulp (b). The online version of this article ( https://doi.org/10.1007/s10570-019-02422-z) contains supplementary material, which is available to authorized users. The financial support from Business Finland (Grant No. 3848/31/201), Stora Enso Oyj and UPM-Kymmene Oyj is gratefully acknowledged. Authors also want to thank to Separation Research Oy Ab and Fibertus Oy for collaboration; Herbert Sixta, Mark Hughes and Michael Hummel (Aalto University) for fruitful discussions, Suzanne Jacomet (CEMEF, MINES ParisTech) for assistance with SEM, Rita Hatakka (Aalto University) for help with pulp composition determinations as well as Hannu Revitzer (Aalto University) for elemental analysis. We thank Dr. Isabelle Morfin (ESRF) for assistance at the D2AM beam line, and ESRF (Grenoble, France) for the provision of beam time. At the D2AM beam line, the WAXS Open for SAXS detector (WOS) was funded by the French National Research Agency (ANR) under the “Investissements d’avenir” program (Grant No. ANR-11-EQPX-0010).